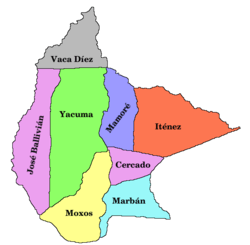 Beni, sometimes El Beni, is a northeastern department of Bolivia, in the lowlands region of the country. It is the second largest department in the country (after Santa Cruz), covering 213,564 square kilometers (82,458 sq mi), and it was created by supreme decree on November 18, 1842 during the administration of General José Ballivián. Its capital is Trinidad. The Benianos have traditionally been mistrustful, and often somewhat contemptuous, of Andean culture, considering themselves to be lighter and more purely Spanish than the Quechua and Aymara-speaking populations of the highlands. Considerable resentment existed against the central government, which allegedly did very little to build roads or integrate the Beni into the economy and political life of the country. These attitudes persisted despite the fact that Beni benefited greatly by the Agrarian Reform instituted following the 1952 Revolution, with many citizens coming into ownership of significant tracts of land. 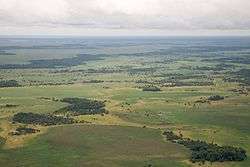 Most of these turned to cattle ranching. The absence of a reliable road linking the department to the main centers of power in the country (owing to the difficult terrain) continued to contribute to the Benianos' perception of isolation, as did the a downturn in the cattle industry. This, in turn, translated in an almost automatic support by both the population and departmental authorities for the Santa Cruz-led effort to federalize the country and devolve powers to the departments at the expense of the central government. Considerable social unrest took place in 2007 and 2008, leading some to consider separatism as plausible. 1 June 2010 16 December 2011 Ernesto Suárez Sattori Beni First Elected in regional election on 4 April; first governor. Suspended under indictment. 16 December 2011 1 March 2013 Haisen Ribera Leigue MNR* Chosen as interim governor by the Departmental Legislative Assembly, supported by the MNR and MAS-IPSP. 1 March 2013 Carmelo Lens Beni First Elected in the first round of the Beni special gubernatorial election on 20 January 2013. Sources: worldstatesmen.org. *MNR members of the Departmental Legislative Assembly, including Ribera have been derecognized by the party since joining the MAS majority in 2010. 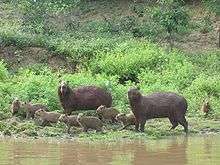 Capybara family in the region of Rurrenabaque, Beni Dept. 1 2 3 "Suspendido... Suárez cae en el Beni MNR asume interinato". El Día. Santa Cruz, Bolivia. 2011-12-17. Retrieved 2011-12-17. ↑ "Beni está dividido". La Prensa. La Paz. 2011-07-17. Retrieved 2011-12-17. ↑ "Critican alianza del MAS y MNR contra Suárez". El Deber. 2011-12-18. Archived from the original on 2014-07-25. Retrieved 2011-12-18. ↑ "Suspenden a Ernesto Suárez y uno del MNR es gobernador del Beni". Oxígeno. 2011-12-18. Archived from the original on 2012-04-26. Retrieved 2011-12-18. Wikimedia Commons has media related to Department of Beni.